Court Summons: Shall we attend? First Court Summons in September 2005, didn't attend. 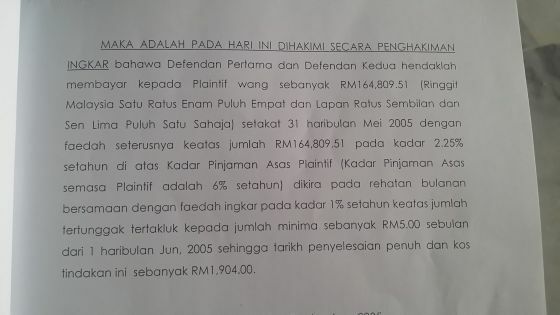 Judgement dated 30 September 2005, amount RM164,000. 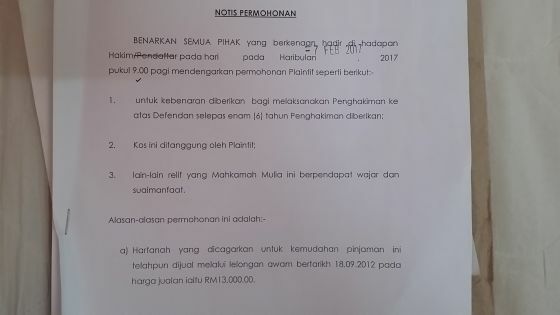 Bank auction (lelong) on 18 September 2012, selling price RM13,000. 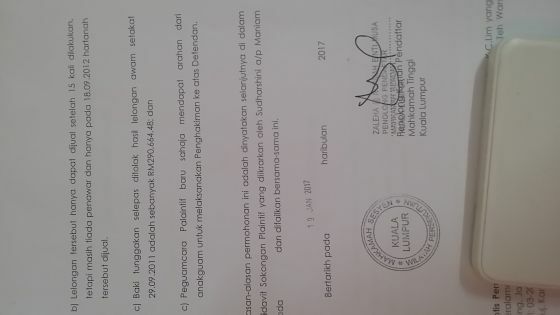 Lawyer firm send a Court Summons request to attend Sessions Court on 07 February 2017. Shall we attend? Please advice. Lawyer firm send a Court Summons request to attend Sessions Court at 07/02/2015. Post image of letter here so we can understand better what it is about. Is it a car Hire Purchase loan? Not a car Loan. It's a shop lot in shopping plaza. Because the Judgement dated 30/9/2005 is more than 6 years old, special permission is required from the Court to use it against you. This document you showed is a document requesting that permission from the Court. When asking such permission, they need to show good reasons why they didn't use the judgement in the last 11 years. You should attend and file affidavits to oppose this request. In your affidavits, you can show why the reasons they gave cannot accepted. If you don't oppose, you can and will become a bankrupt in less than 7 months from now. We decided attend and say need time to hire Lawyer to extend time . And other thing is this loan is bollow by 2 person, one of them is bankruptcy for few year already. but since 7/2/2017 is just a few days away, just ask for time to ''find a lawyer"